Android Flash Tools provides tips for flashing stock ROM and custom recoveries, writing IMEI on MediaTek and SpreadTrum and rooting Android devices. Download Xiaomi Mi Flash Tool (newest versions) for Xiaomi device users who wish to upgrade to stock ROM. The Xiaomi Mi Flash Tool is the Xiaomi owned flashing tool dedicated to help Xiaomi users to flash ROM on their devices and of course will automatically reclaim your device's warranty too. Mi Flash Tool can support both Qualcomm and MediaTek (MTK) chipset based Xiaomi Redmi. Therefore you don't need to use a different tool no matter what Chipset your device uses. So if your Xiaomi is Qualcomm based or MediaTek based device then you can use this tool. 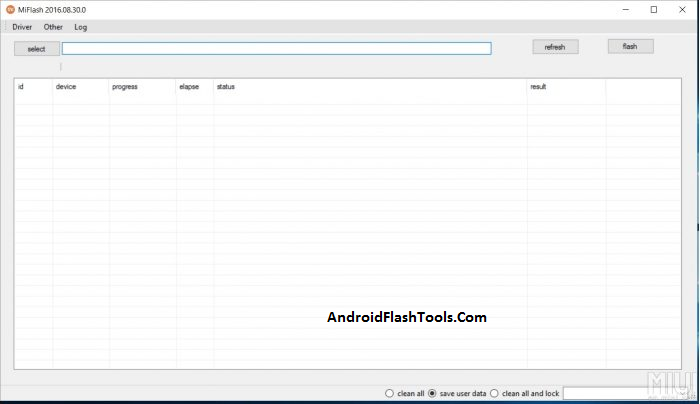 Albeit there is QFIL for Qualcomm or SP Flash Tool for MediaTek but you still can use this tool. Mi Flash Tool is a free tool that you can download without you need to spend even a single penny. Supports MediaTek And Qualcomm Chipset. Mi Flash Tool can be used to flash stock ROM on both MediaTek (MTK) or Qualcomm device and this is the great feature that is not found on any other flashing tools we know guys. Supports Almost All Xiaomi Mi Devices. You can use Mi Flash Tool for nearly all Xiaomi Mi devices. In the Mi Flash Tool zip files you will also be given with USB drivers that will ensure you will have the correct USB drivers for your device. Can Be Used To Flash Multiple Devices At One Time. Using Mi Flash Tool you can not only flash one device but you can flash ROM on multiple devices at one time by the provided configuration. Once you finished downloading Mi Flash Tool then you can immediately run the installer wizard and all the files will be set up for you. In case the firmware you are about to flash doesn't require you to flash all the partitions then you can choose one of the three available options which are. Flash All -- That means is the clean installations on your storage and this will erase all the content on your storage. Flash All Except Storage -- That means the firmware file will be installed but not erased your storage. Flash All Except Data And Storage -- That means the firmware will be flashed but will leave data and your storage untouched. Mi Flash Tool is a free tool so you can download it without the need to subscribe to premium subscription or anything. The following are the Xiaomi Mi Flash Tool based on the version. Download the version you need. Store it on your computer. [*] How to use. Don't know how to use it? Visit how to use Xiaomi Mi Flash Tool page. [*] USB Drivers. You need to download Xiaomi USB drivers installed on your computer. [*] Credits. Xiaomi Mi Flash Tool is created, maintained, developed, optimized and distributed by Xiaomi INC. Therefore all the credits should be given to the name guys all.